Set beneath a Monterey cypress tree in a quiet corner of our two acre plot, The Old Coach was originally built for the Egyptian Railways around 1903. 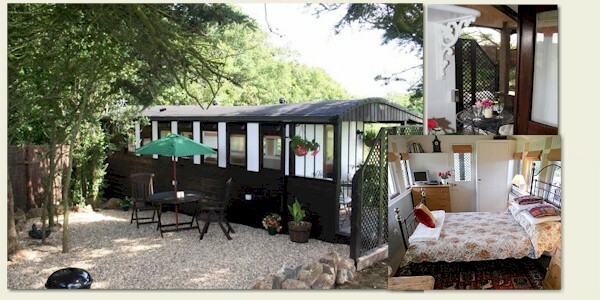 Retaining many of her original features, and with a private garden including garden furniture and BBQ, the Old Coach makes for unique and romantic holiday destination. The property features a fitted kitchen with small fridge, microwave combi oven and electric 4-ring hob. The lounge area doubles as the bedroom with a period-style bed, LCD TV, Freeview & DVD player, pine table and chairs. The half-glazed front door leads out to the sheltered porch and private garden. The newly fitted bathroom provides a shower, matching toilet and basin.